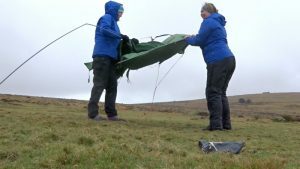 What Do Wild Camping Women Need to Know? If I was any good at lightweight packing I would advise you to take as little as possible to your wild camp, but we women know how much we enjoy those little home comforts, the shiny lights, the blow-up pillow, the hip flask. If you can carry the extras to your chosen wild camp site then please do so and enjoy them, if you can’t, well then the obvious answer is to choose a different, and much nearer, wild camping site. 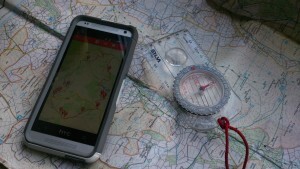 You have to use your common sense about where you are going to wild camp. 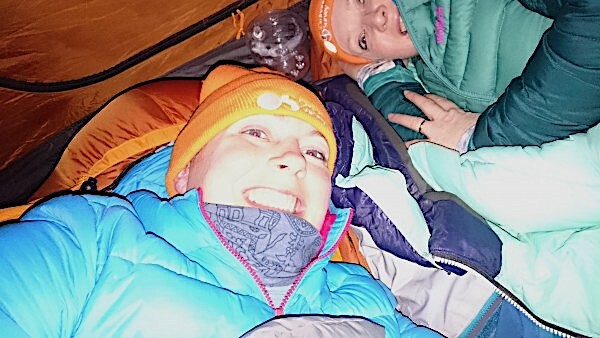 My best piece of advice for wild camping women here is DO tell someone you trust where you are going to be but DON”T tell the world by posting it on social media. Otherwise here are a few considerations. This is a simple one really, don’t take a brand new tent that you don’t know how to pitch out into the middle of nowhere. Most tents can be pitched inside and a little practice will enable you to cope if it is dark before you reach your destination and check that you do have the right poles and pegs. A bivvy bag, by the way, requires no poles or pegs and generally no instructions. I have mentioned warm food and drink already but I like food and I think it is important in a wild camping situation. We can all manage on cold snacks but, if you are feeling a bit nervous about your wild camp, a bit chilly or even a bit bored because you have pitched well before bedtime a hot meal gives you something to do, the flame you need to cook it is psychologically comforting and it will warm you up and help you to sleep. Avoid spicy curries for obvious morning reasons but otherwise, the world of culinary camping is your oyster (although its probably best to avoid oysters too). No activity is without risk so spend some time thinking about possible risks before you go (not too long or else you might not go). It is impossible to mitigate against all unexpected risk but below are some things you might consider. Have you started small with friends and then worked up to ‘the big solo expedition’? Do you know how to do dynamic planning, assessing each risk as you come to it? (If you don’t now, wild camping will help with this.) As an example, check out Julia Lewis’ most excellent (and amusing) solutions to unpredictable beach bivvy problems. 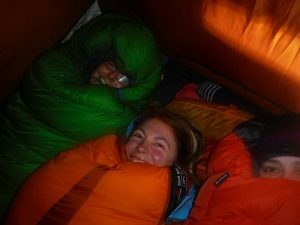 If you are in a group remember to turn your torch off just before you squat down to go to the loo at night. If you have your period remember to bring the means to take everything home with you. If you don’t have your period remember how useful tampons can be. 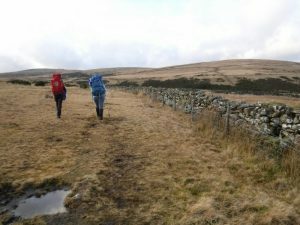 If you are feeling like you can’t go wild camping because you are a woman, read a few good outdoor blogs, there are plenty of women doing it, surviving and enjoying it. A hip flask! Now there’s a surprise though you’re discreet about the contents. I’m sure all these pointers are necessary to ensure one doesn’t make the return journey on a gate, curled by the frost into a foetal position, slightly nibbled by rodents and carried by fellow Wandervögeln who have followed the instructions pinned to your anorak: “This walker is poverty-stricken and on no account should be retrieved by helicopter.” For it’s clear impulsiveness must play no part in going for a walk. That walking is first and foremost a discipline. Thus I infer that the hip flask contains cold tea. And merriment only occurs retrospectively. We play a game called ‘guess what’s in the hip flask’! It is a great excuse for taking many sips. Only snow washes… or waterfalls allowed!